If you haven’t been able to get your hands on one of the surprisingly scarce iPad Camera Connection Kits, there is another way to get photos from your camera to your iPad—assuming you’re already using a camera or memory card with Wi-Fi support. ShutterSnitch is a hybrid iPhone and iPad app that lets you wirelessly transfer photos from your camera’s wireless transmitter or Eye-Fi memory card to your iOS device. Since the iPad can’t create its own ad hoc wireless network, you’ll need to have a Wi-Fi network that both your iPad and camera or memory card can access. Once you’ve transferred your photos you can arrange pictures into albums (including private ones that you can lock), e-mail or FTP images directly from the app, and view large-scale histograms. In addition, ShutterSnitch features Bonjour support to make it easy to transfer pictures between multiple iOS devices or from your iPad or iPhone to your Mac. 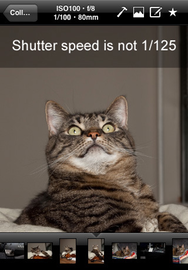 It also allows you to set up audible and visible warnings when an incoming image doesn’t match a particular rule (such as a different shutter speed, aperture, ISO, focal length, or level). ShutterSnitch costs $8 and requires an iPhone, iPod touch, or iPad running iOS 3.1 or later.